Odell Cornelious Beckham Jr. is an American football player who plays for the New York Giants of the NFL. Beckham was drafted by the Giants in the first round of the 2014 NFL draft. Since Beckham entered the NFL, he has been known to be one of the most productive and popular players. However, Beckham has drawn media scrutiny for his conduct on and off the playing field. As of 2019, Odell Beckham Jr’s net worth is approximately $25 million dollars. Odell Cornelious Beckham Jr. was born in Baton Rouge, Louisiana. Beckham attended Isidore Newman School in Louisiana, where he was a letterman in basketball, track, and football. As a senior, Beckham hauled in 50 catches for 1,010 yards and 19 touchdowns. Beckham was named to the Times-Picayune 2011 Blue-Chip list and to the Louisiana 2A All-State first team. He also earned District 9-2A Offensive MVP honors. Odell Beckham started to play football in college while studying in the Lousiana State University, playing for the football team. When he was a freshman he gave the first glimpse of his talent by ending up with two touchdowns. Beckham’s sophomore year was no less eventful and he carried forward his phenomenal form. Beckham did one of the best catches in the history of major college league in the US of America. In 2013, Beckham was awarded the Paul Hornung Award, which is given to the best player in the major college football league. He was selected to play for the New York Giants in the biggest league of them all, NFL. Beckham kept his form in the remaining matches and achieved a huge status among the sports fans. Against the Philadelphia Eagles, he recorded 185 receiving yards, and he set the record for any rookie player that performed that way in the history of the franchise. Odell became one of the most looked after players after the 2014 season and many sportswriters appreciated his playing style. People started to name him one of the most influential rookies in the history of the franchise. However, since then Beckham has been on the cover, which made him the youngest player to have blessed with the honor. In 2016, Beckham was full of successes and even more controversies. He ended up starting in all 16 games and he finished with 101 receptions and 10 touchdowns. He later turned out as Pro-Bowl Selection. As of 2019, Odell Beckham Jr’s net worth is $25 million dollars. Favorite Quotes from Odell Beckham Jr.
“Life will be full of opportunity if you are willing to go out and chase your dreams. You might have to put in a lot of work to get there, but if you persevere and stay focused on your end goal, your efforts will be rewarded.” – Odell Beckham Jr.
“The hard work and time that you put into chasing your dreams will make your success that much better and will teach you patience and discipline. So don’t shy away from the work, embrace it and use it to accomplish your goals.” – Odell Beckham Jr.
“Everything on this planet has a predetermined purpose: bees pollinate flowers, leaves absorb carbon dioxide and produce oxygen, and rivers carry minerals and nutrients to various ecosystems along their banks. Human beings have a purpose too, although we may not know our own individual purposes in society until we were to pursue our goals.” – Odell Beckham Jr.
“Whether you are an athlete, a business manager, or a lawyer at a large firm, teamwork is a crucial part of your success.” – Odell Beckham Jr.
“Although it is important to stay focused on the present, it is important to have a plan in mind that you can follow to accomplish your goals. It is also important to set new goals for yourself as you go along so that with each victory you can continue to aspire and work towards a new victory. This will help you maintain discipline and keep you motivated to give every day your best.” – Odell Beckham Jr.
Odell Beckham Jr. is one of the best NFL players in the league. With his new deal, he will become the highest-paid Wide Receiving in the history of the NFL. There’s no doubt that Beckham’s net worth will continue to increase in his next future as a successful NFL player. As of 2019, Odell Beckham Jr’s net worth is estimated to be roughly $25 million dollars. 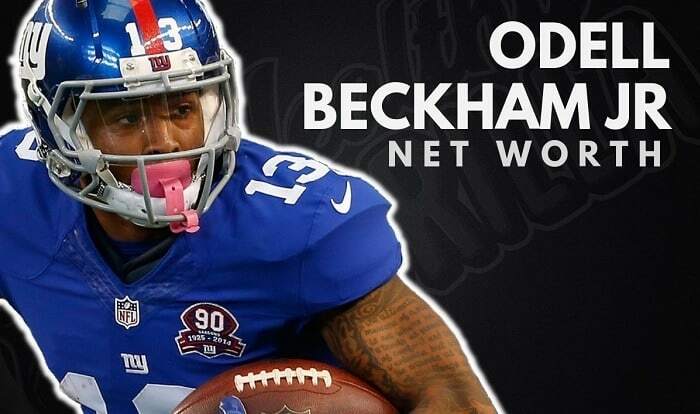 What do you think about Odell Beckham Jr’s net worth? Leave a comment below.